Did you ever think that the green leaves you sprinkle on your biryani as a garnish could be the secret to your glowing skin? Coriander, also known as ‘hara dhaniya’, is a member of the Apiaceae family. Other members of the same family include celery and parsley. Traditionally, it was an essential ingredient in oils and perfumes too. It is a herb with a pungent smell. The fresh aroma can make you feel instantly rejuvenated. Its anti-septic and carminative properties make it unique. What is coriander good for? Coriander is extremely rich in folate, antioxidants, vitamin C and beta-carotene. Your skin feel soft, supple and radiates glow when your cells are protected from oxidative stress. They can be armored against stress and degeneration with the help of antioxidants. These antioxidants prevent the movement of free radicals in the body, thus slowing down the ageing process. It allows the skin to retain its elasticity. It is a powerhouse of iron which leads to an increase in the hemoglobin levels in the body and prevents anemia that can cause dull skin. It is a well-known fact that your skinis a reflection of your internal health. Whether your skin is too oily or too dry or even a combination of the two, chewing fresh coriander leaves every morning on an empty stomach is a great healthy practice. Be it acne or pigmentation, oily or dry skin, pimples or blackheads, coriander juice works like magic. Coriander’s anti-fungal and anti-microbial elements are even known to treat eczema. It is a detoxifier, a disinfectant and even treats dark lips! According to Dermatologist Dr. Deepali Bhardwaj, “Coriander helps relieve acidity. Due to acid formation, redness, bumps and zits are a common feature. Eating coriander can reduce acidity and thus, help you get rid of various skin eruptions.” She also explains while applying coriander on your face, it is most effective when combined with rose water and oatmeal or sandalwood in the form of face packs. This helps in avoiding any sort of allergies and dryness as a result. can be applied on the skin. This helps to get rid of wrinkles. A combination of ground coriander with some lemon juice when applied on the effected area can do wonders for acne and blackheads. 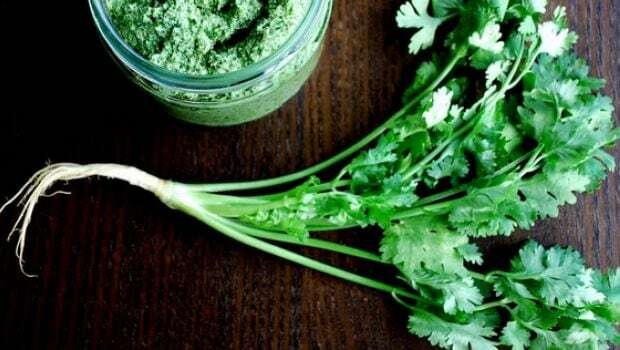 Coriander enables the dead cells to be removed and leads to a rejuvenated skin. Grind the coriander, add milk, add honey and lemon juice and apply on the face. This face pack will leave you with glowing skin. A combination of ground rice and yogurt relaxes facial muscles and cells and leaves you refreshed. Make a mixture of it and apply it like a mask. When your skin fails to show a positive response, we know how frustrating it can get. The least you can do is seek comfort in the confines of your kitchen and grab a handful of coriander! You’ll thank us later.